Formosan black bears are found in mountainous forests in the eastern two-thirds of Taiwan at elevations of 3,300 to10,000 feet. In the Winter, rather than hibernating, they will simply move to lower elevations in search of food. 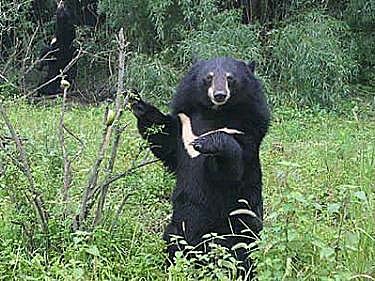 Formosan black bears range in size from 47" to 75" in height and weigh from 110 lbs. to 440 lbs., having long thick brownish-black fur. They are very territorial creatures and mark their territory with scratches on trees or urinating on the ground. They are also very solitary creatures except during mating season or when caring for their offspring. Like most Asiatic black bears, the Formosan black bear is nocturnal, feeding at night and spending the day resting in hollow trees or caves. Formosan Black Bears are omnivorous creatures, feeding primarily on leaves, buds, fruits, roots, insects, and small animals. They will also eat carcasses and carrion and just about anything they can find. Mating season is in the Winter. After a gestation period of about eight months, the female will have typically one to three cubs which remain with their mother for one to two years. The Formosan black bear was listed as an endangered species under Taiwan's Culture Heritage and Conservation Law in 1989. They are also protected by the Convention on International Trade in Endangered Species of Wild Fauna and Flora (CITES), banning all international trade of any products derived from the species. 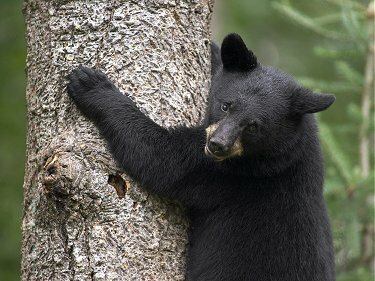 However, illegal hunting and destruction of the bear's habitat have still continued to threaten the bear's existence. 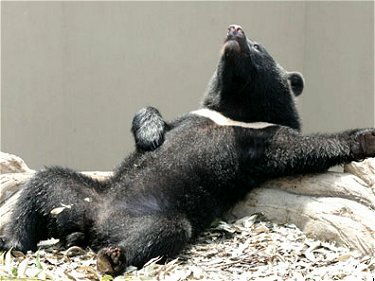 The natural life span of Formosan black bears is 25 to 30 years.